How to convert other image formats to PDF? This tutorial shows how to convert images (jpeg, png, gif, bmp, jpg) to PDF using novaPDF (and also multiple jpeg to PDF). novaPDF is a PDF creator that allows generating PDF files from any Windows application that supports printing. If you don't have novaPDF installed, download and install it. To convert an image to PDF, select Print from the image viewer and choose novaPDF as the printer before click on OK.
Right-click an image (or open it with the above mentioned Windows image viewers) and select Print. The photo printing wizard will start, click on Next to continue. In the Picture Selection window you'll see all the images from that folder and you can select the ones you want to convert to PDF. Simply check the images you want converted and click on Next. In the Printing Options window select novaPDF Printer using the drop-down list and additionally you can modify novaPDF's settings by clicking on the Printing Preferences button. Click Next when finished. The Layout Selection window will give you the option to choose a format for printing the images, as well as the number of times to print the same image (you can use the Wallet Print type to have multiple images on the same PDF page, or use the Full Page Prints to have one image on a single PDF page). Click on Next after you selected a printing format. You'll be prompted to select a path where the PDF will be saved (this is the default behavior of novaPDF but can be changed so that it will automatically save the PDF in a specific location), and after that the PDF will be generated and opened with the default PDF viewer (automatic PDF opening can be suppressed too). Open Picasa and select the images that you want to convert to pdf (can be a single image or multiple images if you want to convert multiple jpg to PDF). Go to File and select Print (additionally you can press Ctrl+P or click the Print icon from the lower toolbar). In the Print window you have to select novaPDF Printer from the Printer Settings section. Additionally you can choose the printing layout for the images (single image per page, multiple images on a page), as well as selecting the number of copies per PDF page. After clicking the Print button you'll be prompted to input a location for the PDF file and when that's created it will be automatically opened (these settings can be changed using novaPDF's Printing Preferences window). 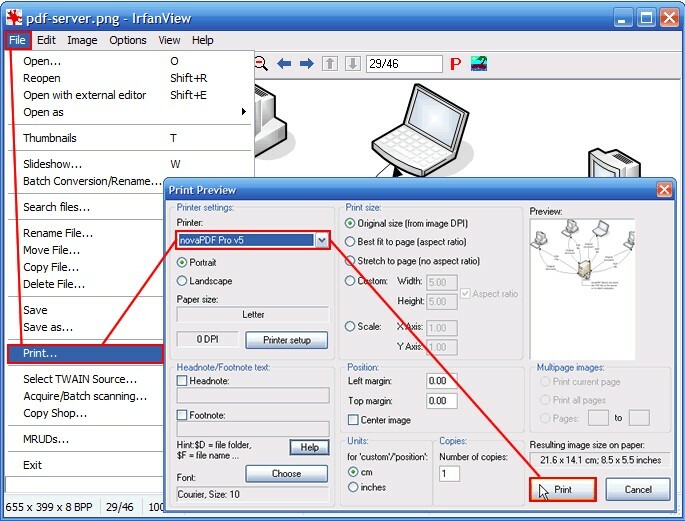 In Irfanview go to File->Open, select the image that you want to convert to PDF (can only be a single image) and click on Open. Once the image is opened, go to File and select Print (additionally you can press Ctrl+P). In the Print Preview window you have to select novaPDF Printer from the Printer settings section. Additionally you can add header/footer information, choose a print size as well as selecting the number of copies (separate pages).